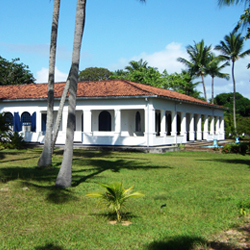 The Instituto Sacatar occupies a 9000 square meter property on the island of Itaparica, the largest island within the Bay of All Saints. A narrow strip of native mangrove forest screens the property from 180 meters of secluded white sand beach. The site is quite pastoral; monkeys still live in the surrounding trees. 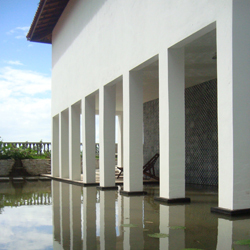 Located in the center of the property is the Big House where the artists eat and sleep. Each artist has his or her own bedroom with attached private bathroom. Sacatar also provides each Fellow an individual studio, distinct from his or her bedroom suite. All of the studios are simple rooms that can easily be adapted for other disciplines. Five of the studios and a woodworking shop are clustered around the coconut grove facing the ocean. Two studios are located on the ground floor of the main house. 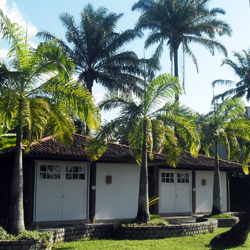 Also on the property are an administration building, a staff support building, a wood-working shop and a guesthouse. In this central house, each Fellow has a private bedroom suite. 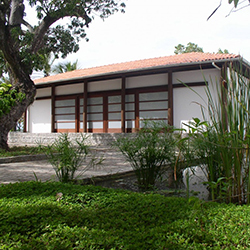 The historic structure was built in 1950 by Henriqueta Catharino as the retreat of the Instituto Feminino, a progressive girls’ school that she had founded across the bay in Salvador in the 1920’s. The house has five bedrooms with attached baths, a kitchen, library, dining room and living room, all arrayed around a central courtyard. There are also two artist studios located on the ground floor. VISUAL ARTS: Two visual arts studios are open-air, measuring 6.0m x 6.0m, and have ample wall space, work sinks and private internal gardens. The wind and the birds can enter these studios freely. Tortoises also occasionally visit. Two additional studios in the main house offer a more controlled environment. One measures 6.0m x 8.0m, and the other 3.5m x 5.0m, both with ceilings 3.60 meters high. The smaller of these two studios has a sink. LITERATURE: A studio raised on wooden posts primarily serves writers, but has also served as a studio for digital photography and computer art. The studio measures 5.0m x 5.0m and offers panoramic ocean views. On occasion writers use some of the other studios for their work. Sacatar does not provide a printer. We suggest that writers bring a portable printer for their personal use. DANCE / THEATER: At the far end of the coconut grove is a studio for dance and theater. It has a sprung wooden floor (5.0m x 12.0m), with an adjacent dressing room (3.0m x 3.5m), sometimes utilized as the Fellow’s bedroom. Large sliding doors open to the beach on one side and to the property on the other, which permits the studio to transform into an impromptu theater with a dramatic ocean backdrop. A wall of mirrors can be curtained off (which stops the peacocks from attacking their own images.) Sacatar can provide speakers and percussion instruments, but artists should bring their own equipment for recorded music. MUSIC COMPOSITION: Another studio raised on columns (4.5m x 10.0m) has phenomenal ocean views. While not soundproof, it is located at the furthest corner of the property, where musicians are less likely to disturb the other Fellows. This studio was not conceived as a recording studio and Sacatar does not provide recording equipment. However, we do provide a full-size portable electric keyboard and an extensive collection of percussion instruments for the musician’s use. This studio can also serve as a visual arts studio, since its walls provide a suitable surface to pin up canvas and paper. There is also a bathroom, exterior sink and wash-up area outside, just behind the studio. 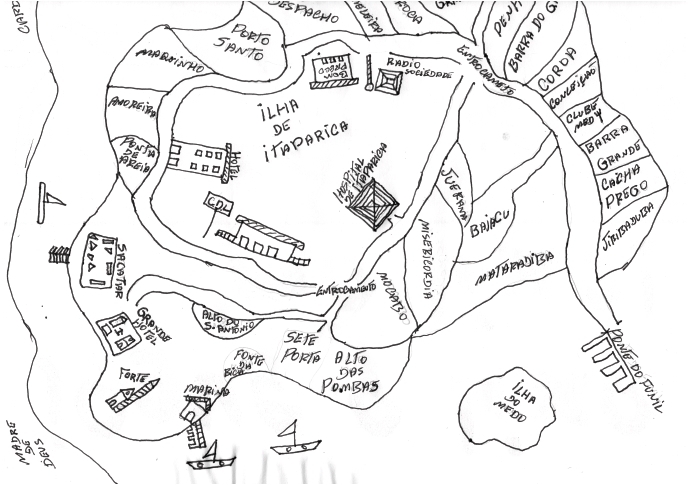 LIBRARY: We have a broad collection of books, CDs and DVDs, with extensive material about Bahia, Brazil and the local culture, in English, Portuguese, and other languages. We ask that artists bring a book, CD or DVD of general interest – their own work or the work of others – to expand the collection. WOODWORKING SHOP: Artists are free to use the woodworking shop, which is also used by the maintenance staff. The woodshop has a circular saw, a planer and common hand tools. 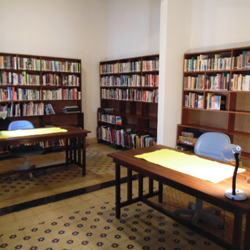 Former Fellows have left supplies in an adjacent room for artists’ materials, where current Fellows are free to forage. INTERNET: There is WiFi internet access for residents’ personal laptop computers. Artists should bring their own laptops, as needed. 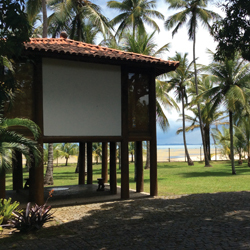 There are also several internet cafés within walking distance in the town of Itaparica. Internet service on the island of Itaparica is not always reliable and Fellows may at times find themselves at a temporary loss for internet service. Please plan your work and communications accordingly. FOR PHOTOGRAPHERS: There is a small refrigerator exclusively to store photographic film and film stock. We have no dark room, so non-digital photographers are limited in the work they can finalize at Sacatar. FOR CERAMICISTS: We have no kiln, but there are possibilities to work at the local brickyard where there are four large wood-fired kilns or in the village of Maragogipinho two hours away, where there are over seventy wood-fired ceramic workshops. We are in a technically limited location and encourage artists to work simply and directly with few complex tools, materials, or technologies.